How about that new Janome? Janome has recently released it’s latest Horizon 8900 Q C P. When it’s release was announced apparently many quilters began to form a line. They have gotten the bugs out from the Horizon 8200 Q C, which some quilters had noticed, and apparently the corporation did as well. While making the changes they, beefed it up as well. I had the 8200 QC, when I brought home the 8900 QCP I was quick to make comparisons between the two machines. My initial reaction? I Love it!!! From the moment I took my first stitch, I felt a noticeable difference. For one thing, it purred, it hummed The motor seemed so smooth. I liked the stitch quality. 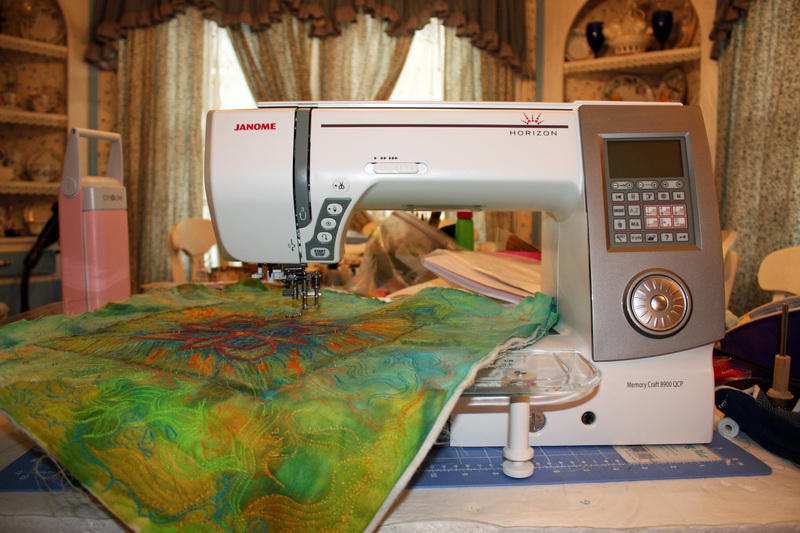 It now has 2 easy to change needle plates, one for regular stitching, the other for free motion quilting. No more silly screws to unscrew and re screw, and drop several times in the clumsy process, if you’re a butterfingers, like myself. Just pull a latch and up pops that needle plate, bim bam boom. Easy! The previous model’s slider thingy[ a very technical term ] in the one needle plate, which changed from regular sewing to free-motion was problematic to say the least. As I mentioned it’s been replaced with a very convenient solution. I like the way the free motion quilting went, it seemed that the fabric movement was smoother, don’t ask me how this could be accomplished, but it was my impression. I like the idea of the jog dial, it would be a nice little convenience, although I have not used it as yet. So my initial impressions are very favorable thus far.” I like it a lot”. How about you? If you have any thoughts, share your impressions with us. Ref pre purchase guidance, there is little help but I did as much online research as I could which helped. I went to the NEC sewing show this month and was surprised that it did not seem to feature. It’s an amazing machine for all purposes and six months on, I can’t really fault it. Still not used all the functions but it does everything so well. Mildly irritating is the durability of the plastic as I have broken the one bit off the plastic cover for the bobbin on both needle plates …maybe I am handfisted but never had this with previous janome machine. I wd totally recommend this machine to all sewers or quilters. Quality stitching throughout all functions. Enjoy! That is so amazing what a great deal . they must be coming out with a new one is all I can think of. That table alone is worth whatever they were charging for it, because it’s essential if you quil, you got it free . that is great. You can leave one set up for straight stitching. And leave the other one set up for quilting. You got the deal of the century! I was wondering if you have had much experience with sewing through thick materials (like when sewing bags with lots of layers). Also, how accurate if the 1/4 piecing given the large 9 mm area? Thanks so much for the wonderful review. Love the blog. I sew through multiple thick layers, often including a layer of stiff stabilizer, if I’m doing heavy amount of thread painting. in making art quilts.Never had any problem whatsoever. The 1/4 piecing seems very accurate to me. But I think it’s always a good idea, when considering this large of a purchase, to go right into a dealer and play around on the machine. Let them demo it for you and ask lots of questions. Nothing like hands on. The machine has 3 needle positions and a quick “go to” button for the 1/4 seam. I have used a Viking Husquavarna Designer 1 for the last ten years. It recently died, as in – it would cost me approximately $800 to repair. Since I don’t really use the embroidery aspect of the machine (I had grandiose dreams when I originally bought it), I am interested in a reliable strong quilting machine that provides great FMQ features. I was looking at the Janome Horizon 7700. I found a certified pre-owned one for $900 from a dealer. In my conversation with the dealer he suggested that I consider the 8200 – he could sell it to me for $1900 new. In my research, I am wondering why I would want the 8200 over the 7700, or even the 8900? I am actually now thinking that if I buy a new machine, then I would be better served to buy an 8900. Does anyone have any insight to offer comparing the 8900 to the 8200 and/or the 7700? What would be a good price for a new 8900 today? I appreciate any and all input and/or direction to find my answers. Carli, I know nothing about the 7700, but I have owned the 8200 and the 8900. Here’s what I know, have read or found surfing the net and have theorized. When the longer necks were introduced on the market by Viking, Janome quickly followed with their own model of the longer neck. From what I read, there were engineering problems and challenges that had to be overcome in designing this new technology. My theory is that the earlier models had a few kinks to work out and those companies have done so. I assume there had to be a learning curve. So they continued to improve. I think the later models got better and better. That’s been my experience. I had a 8200 and it was good, but the replacement 8900 was so much better and had so many just awesome features, I love it. I did a review of the features I enjoyed and I’ll try to find that link for you, post it in a comment box following this.